Catherine has had a busy couple of years. As well as single-handedly writing two series of the Bafta-nominated New Teletubbies she also co-created and was Head Writer for Waffle the Wonder Dog (Cbeebies, series 2 currently in production) and Chip & Potato (streaming on Netflix in 2019). Prior to that, Catherine script produced and wrote many episodes of Bafta-winning hit show Topsy + Tim (Cbeebies). Her schtick is immersive, emotionally-engaging, funny story-telling for young children: love and laughter. 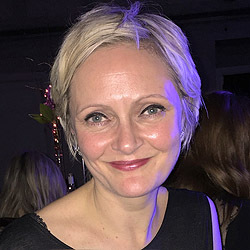 Previously, Catherine script edited many other critically-acclaimed, much-loved, family favourites, including Pocoyo, Girls in Love, My Parents Are Aliens, Shaun the Sheep, Baby Jake, Bear Behaving Badly and Pet Squad.